Wood bricks are a fantastic alternative to burning cord wood. Made of kiln-dried, super-condensed recycled wood chips and sawdust, they can be burned by themselves or added to cord wood to produce cleaner-burning, longer-lasting heat than cord wood alone. Because they are manufactured for optimal burning, they produce more heat than logs and consistently come with low moisture and high quality. Why should I switch from cord wood? Convenience: Cords of wood are usually delivered to you in a pile dumped on your lawn or driveway. Then the moving, stacking (and sometimes splitting) follows. Even more time and effort is added if you have to season your logs before use. Also, one pound of biomass bricks is equal to 1.7 pounds of cordwood in terms of how much heat you get. This gives you 70% more room for the same amount of heating fuel! Wood Bricks are delivered in a neat clean packaging on a pallet. 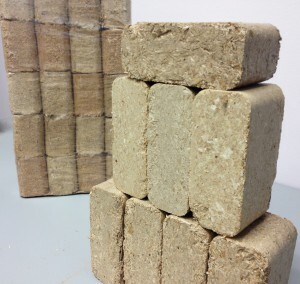 Depending on the brand of biomass brick, the ton is typically comprised of 50 packages of 20 bricks. They can remain on the pallet, or the ton can be split up for quick stacking in tight spaces. Cleanliness: Not only are biomass bricks environmentally clean, but also clean for your home: bricks are bark-free and bug-free. Wood chips and sawdust are the only components in the kiln-fired bricks, which means there is no chance for insects to make homes in them. Firewood can bring a variety of insects such as wasps, ants and beetles into your home. This is why campsites do not allow cord wood to be brought in for campfires. Handy Camping Tip: Packages of biomass wood bricks can be brought camping, and happen to be excellent for campfires. Bricks light quickly, burn clean and burn hot. The hot ash bed alone (which is perfect for cooking food and s’mores over) from burning bricks puts out more heat than a log on fire! Consistency: Even with the more expensive kiln-dried or pre-seasoned cord wood, burn time and heat output can vary due to size and wood type/age inconsistencies. Compressed wood bricks are dried and pressed in a mold, making a uniform shape in the same size every time. Cord wood has many variables (seasoned vs. non-seasoned, wood type, size, kiln-dried vs non-kiln-dried, etc.) so the BTU level can be unreliable. Furthermore, in order to burn properly, wood should be between 15 and 20 percent moisture. To achieve this level of moisture, at least a summer of proper storage will be needed to dry out. Wood bricks burn at about 7800 BTU/lb – much more efficient than air dried cord wood which typically burns at 6500 BTU/lb. Also, the bricks are dried to less than 10% moisture before they are packaged and delivered! Efficiency: Wood bricks are manufactured to release as much heat as possible when they burn. When anything burns, the energy is released as heat and light. Compared to cord wood, bricks release much more of their energy as heat vs. light, maximizing the BTU’s being generated per pound. Cord wood will sometimes generate larger and brighter visible flames, but the energy used to make those bright flames is wasted when it comes to heating. Many first time customers are surprised at just how much heat will be coming off a burning brick when they are used to seeing the larger flames that cord wood generates. To summarize – biomass bricks are easier to deal with, environmentally sound, free of chemicals and insects, safe for camp sites, have reliable heat output, are hotter than most firewood, have a consistently low moisture level, and are extremely efficient. How do I use wood bricks in my wood stove? To burn bricks alone: A popular method is to make a teepee with three bricks with a little crumpled newspaper underneath to light. Once the first bricks are lit, stack bricks in a small pyramid in front, pushing the teepee towards the back of the stove. This method allows for a slow steady fire back to front, with one more restack in the late evening to make it through the night. To burn bricks with cord wood: Joy, our Customer Service Manager, burns both bricks and cord wood in her wood stove. She places 5 to 6 bricks across her stove with newspaper / kindling in between, and stacks cord wood on top. She loads her stove half as often as when she used wood only, and she keeps her family nice and toasty! Remember, you can also use wood bricks in fire pits! The easiest method is to make the kindling/tee-pee arrangement and add bricks as needed. Even if you don’t add bricks, they will form into a nice hot ash bed, which puts out more heat alone than cordwood with flames. 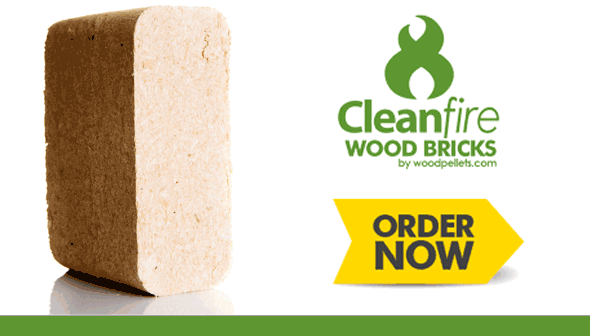 Order our brand new Cleanfire Wood Bricks by calling 1-800-735-5387 or order online!